Is That Rain on My Leg? That must be why this PAC is dedicated only to electing Republicans to the state Senate and little else. 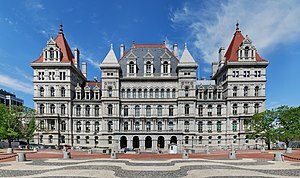 It also must be why the PAC has teamed up with similar chambers of commerce from such upstate locales as Long Island, Westchester County, and the mid-Hudson Valley. Rudnick said the realities of one-party rule in Albany force the Partnership and other groups across upstate and the metropolitan suburbs to consider Republican candidates. He pointed to the last state budget and projections of continuing deficits as evidence that the Legislature — under complete Democratic rule for the first time since the 1930s — is ignoring upstate’s economic plight. I know that everyone pines for the days of a Republican senate majority, when taxes were low, businesses unencumbered, population and economic growth were the rule, when Bruno was one of the three in a room, and great names like “Volker” had an infinitesimally larger volume of clout than they do now. And that’s the point – that it doesn’t matter what party an Albany politician belongs to. It doesn’t matter which party controls the Governor’s Mansion or a particular legislative chamber. No matter what happens, money trumps all, and the vast majority of the population gets screwed. For an Andrew Rudnick to suggest that flipping the Senate so that Skelos is in the room with the next embattled ethical mess of a governor will make a stitch of difference is epically ridiculous. After all, these are the people who gave us the facile and self-contradicting Unshackle Upstate. At least we can laugh at it all. There’s a wonderful and hilarious postscript to this story. State Sen. Antoine M. Thompson, D-Buffalo, who coordinates the campaign efforts of Western New York Senate Democrats, did not return a call seeking comment. It has much more impact when a Larry Quinn says it, and what he says is beyond perfect. As I report in today’s paper, a committee of mostly former City Hall insiders has been meeting since last fall to consider ways to fix City Hall’s cluster-you-know-what management of its economic development and block grant programs. As I reported in October, the group is populated with a lot of the same folks who had a hand in creating the problems they are now being asked to fix. The results are predicable — hire better people, get the bureaucracy working better and address the obvious problems. In other words, blah, blah, blah. City administration after city administration has failed. State government has failed. County government has failed. They have failed to address the root problems in favor of doling out patronage and – well, favors. They choose to argue over insignificant crumbs rather than band together to make actual progress or address genuine problems. Doing so would buck the status quo, and we can’t have that. To be conscientious and competent in government here in WNY is rare, and oftentimes punished. But the same can be said of what passes for a fractured and broken “business community” here, where the predominant chamber of commerce can’t get out of its own way, and makes decisions that largely help entrenched power players. Our local chamber of commerce is so tone-deaf that it makes, arbitrary suggestions with no foundation behind them regarding reduction of the state budget, but in the next breath fights vehemently for billions in state funding for pet programs. The business leadership in this community is as insular, as parochial, as racked with self-indulgent failure as are our governments. Of course, the two are so inextricably linked, and so driven to preserving everything just the way it is, playing a game of “it’s 1955” make-believe, that only microsurgery could separate them. Larry Quinn’s letter is focused on one specific issue – the management of block grant programs and economic development entities in the city of Buffalo. But its message extends to the management of any and all programs funded by outside money, and to all economic development entities in Erie County. Hell, you can throw in the local old money and their foundations to that frothy cauldron of failure that regular people are saddled with here, locally. A revolution is definitely in order around here. Not some half-assed ideological tea party revolution, because these problems far transcend party politics. A revolution where entrepreneurship is encouraged, mentored, and assisted. A revolution where entrenched interests and old money no longer control pursestrings or narratives. A revolution where government is a meritocracy rather than a deadly sludge of patronage and payback. A revolution where favoritism is no longer tolerated, and where decisions are not made based on who knows whom. Then again, the overwhelming majority of people in this area either don’t care, or else derive a direct or indirect benefit from the current system – from the status quo. So, don’t hold your breath. HT Jim Heaney at the Buffalo News, and @braybc on Twitter. On Tuesday, the Buffalo Niagara Partnership, henceforth referred to as the Feckless Foundation, proposed a whopping $12 billion worth of suggested changes to the state budget so as to reduce the state’s budget deficit. So, Chris and I took to the Twitters to propose other #bnpbudgetcuts. Enjoy. Unshackle Upstate held a town hall meeting yesterday, where businesspeople from WNY could talk directly to such luminaries as Senator George Maziarz and Assemblyman Dennis Gabryszak. The town hall was held between the hours of 3 – 5pm. When most people are at work. Even what passes for a chamber of commerce can’t schedule something so regular working people can attend.